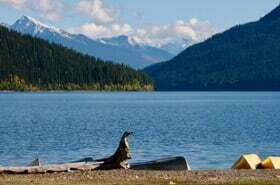 Bowron Lake Lodge offers a range of activities and adventures that guests can enjoy on a daily basis. No matter how old you are or how long you are planning on staying with us, there is always something to do at our resort. Take some time to enjoy the peace and quiet at Bowron Lake by putting away your cell phone and enjoying the scenic views backdropping the clear lake water or spending the day reading your favourite book on our private beach. Children can safely play at the water’s edge or go for a swim, as the lake offers a sandy bottom and few weeds or sudden drop-offs. 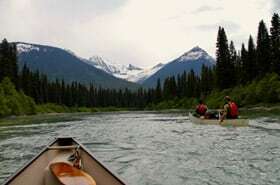 Guests who are looking for a one-day adventure in the park can pack a lunch and paddle approximately 5 miles/8 km to the end of Bowron Lake to experience the Upper Bowron River and Bowron Slough. Here you will be able to get up to close to many different animals that frequent the area, such as moose, bears, eagles, fish, hawks, song birds, beavers, and muskrats. 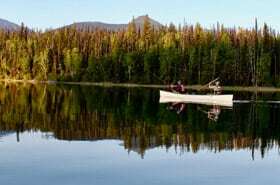 Spend the day fishing in the lake to catch lake trout, dolly varden, rainbow trout, and kokanee salmon or taking pictures of the breathtaking scenery and wildlife. Depending on walk-on openings with Parks BC, campers can also consider turning their one-day adventure into an overnight trip to the west side of the park. Here they will be able to enjoy a real wilderness experience, while also greatly improve their chances of seeing wildlife as the sun sets and rises the next morning. Walking to the surrounding area to possibly see moose, bear, deer, eagles, etc. Hiking into Kibbee Lake, which is the first portage on the canoe circuit, to see the canoeing parties as they start their adventures. Visit the restored site’s many stores, rooming houses, shops, and businesses. Visit the church, which still has weekly services in the summer season, or the old cemetery. Attend the courthouse with Judge Begbie. Eat sourdough bread, rock candy, or homemade fudge. Watch the live burlesque show from those times at the Theater Royale. Travel a short distance to Wells to visit the museum and stores of a town that was built around two gold mines.